Designing a home, both inside and out, is a thrilling but difficult process. Many of us love the idea of having a say over design, whether in a home that’s still being built, one that’s being remodeled, or simply one that’s being furnished from scratch. However, once you actually set yourself before an empty room and start plotting out the specifics, it can all become pretty overwhelming pretty quickly. It’s harder than most expect to land on just the right vision, and even harder to bring that vision to life. Inevitably, there’s a lot of trial and error involved. Now, for some homeowners (or designers for that matter), it’s this process that really makes for most of the excitement. That is to say, some will thrive on the difficulty and enjoy the challenge. Most, however, wouldn’t mind seeing the process simplified a little bit – which is where some very exciting new technology may come into play. Augmented reality became a legitimate, widespread consumer technology just a couple years ago, and at first there was little thought given to whether or not it might affect home design. For those who may not have come across it or experimented with it just yet, AR allows you to infuse your own reality with virtual elements. You can look through your phone screen, using its camera, and see whatever room you’re aiming said camera at, with virtual augmentations. So, for instance, where home design is concerned, you might be able to look through your phone at an empty room, and picture a realistic, to-scale, 3D rendering of a new couch and coffee table there. Right now AR is somewhat limited in that using it through a phone is a little cumbersome. It’s still very effective, however, and in the near future it’s expected that AR glasses will be released by major tech companies, bringing a new level of convenience and immersion to the technology. Even now though, there are ways in which phone-based AR is helping to remove the trial and error (and thus the frustration) from home design. Astonishingly, home furnishing and décor have actually come to represent a fairly major category in the early augmented reality app market. A whole collection of mobile programs already exists, with each one designed to help a user furnish and decorate a home. Each app is different, but all together they can assist with everything from making a 3D floor plan to choosing specific pieces of furniture, and just about everything in between. It can all seem somewhat surreal, though when you consider where AR is coming from – effectively branching off of virtual reality – it’s actually a fairly natural application. VR emerged mostly through video games, where any basic interior environment is as complex or more so than the average home floor plan. In other words, a given VR mystery game might place you in a virtual room surrounded by couches and tables, old carpets and paintings on the walls, and all sorts of objects to observe and explore. By contrast, an AR program allowing you to pick pieces for your new living room seems easy! Where gardening and yard work are concerned, there may actually have been less precedent in VR. For the most part, VR environments have been comprised of either indoor spaces or complete fantasy lands, with little focus on realistic outdoor spaces. A few adventurous games like The Talos Principle VR do show some fairly ordinary outdoor scenes, and even some simpler games, such as the earliest VR casino adaptation, have touched on vegetative surroundings. Said adaptation is called Gonzo’s Quest, and it’s advanced from being among the popular free games offered by casino sites to becoming the first animated slot reel in VR – complete with the lush surroundings of a fictionalized ancient Peru. These games constitute a fairly broad spectrum, but do show how virtually rendered plant life can create a fairly immersive and realistic experience – which leads us to the related AR applications. Just like AR can be used to simulate the placement of furniture in a room, it can now be used to help people plan specific features for their yards and gardens. And as in the games just mentioned, some of the effects can be surprisingly realistic, which makes the planning process that much more authentic. Beyond helping people to virtually place sofas, plants, etc., AR has also proven to be a helpful tool where some of the finer points of design are concerned. Focal Upright Furniture has previously touched on the need to measure dimensions when arranging furniture, and this can be a tedious, difficult, and imprecise process when done with ordinary tools. AR, however, can do it through technology, such that all you really need to do is “scan” a room or object with your phone to get exact measurements. It can take a little getting used to, but it’s ultimately a very simple alternative to traditional measuring, and it can help you make plans for whatever space is at hand that much more precise. Through these features and capabilities, and likely more to come, AR really is showing the potential to drastically simplify the home and yard design process. A well decorated room necessitates just the right balance between aesthetics and functionality. With the added challenge of specific dimensions, it is truly a tough act to master. No matter how you arrange your room, there is always something that can be improved upon. When working with ample space, decorating is a cinch; however, if your living space is of equal dimensions, such as a square, the interior has to be set just right – so as to enhance the look of the room while making sure the comfort and style you want your room to exude remains intact. When working with evenly shaped rooms, you will want to avoid setting out a central piece; as that serves to focus the attention towards itself. The challenge faced with square interiors is that the equality of the room tends to leave little decorative freedom. Thus, this article aims to help you with your interior decorating conundrums in budget-friendly smart ways. You’ll never have to doubt the arrangement for your sofa, loveseat, or recliner in a small square room. Traditional décor stamps the placement of sofas in front of walls, adjacent to walls with ornamental elements such as fireplaces, windows, or art installations. However, contemporary décors have done away with this rule, leaving it up to the home owner’s aesthetic. Before purchasing one, decide on where it would look best. If placing them in front of windows, choose low-back sofas to help them integrate easily into the room. While diagonal placements should be avoided, if opting for it, make sure you buy the correct type of sofa; one preferably not too wide. Additionally, avoid placing colossal L-shaped sofas in small square rooms. These grab attention, and tend to make the room seem more brought together and small; such sofas work best in larger square rooms. Look into U-shaped sofas instead, as they bring a sense of cohesiveness to small square rooms. These also eliminate the need for additional design elements such as tables, leading to more open spaces. Prior to purchasing, ensure you have calculated the measurements and breadth of the overall room, and the dimensions of the space you have chosen to set the sofa in. Give yourself time to research before you commit to a purchase. It is advisable to map out the measurements of the sofa you have your heart set on, in the room with the help of some newspaper. This should give you a healthy assessment of your needs versus desires, and help you stick to a size and style better suited to your small square room. Even if you prefer a certain style, it is advisable to remain modest in size for a downsized version. Picturing something in a room is much different than having it occupy space in reality. What may seem appealing in the moment, you may end up regretting down the lane, which is why researching beforehand is of utmost importance. It is worth noting that many people make the mistake of purchasing the wrong size and style of sofa. Impulse buys may outbalance the entire room, sticking out like a sore thumb in contrast to the dimensions of the room. When arranging your furniture, you will want to avoid placing sofas in odd corners. Sofas must be placed so as to enable an easy flow of communication. If your sofa faces your television, make there is seating around the TV as well, to help bolster face-to-face interaction. When arranging sofas in front of walls space the two, one or one-and-a-half foot apart. Face them opposite or adjacent to loveseats and small couches to enable better conversations. Loveseats provide additional seating space and work well in smaller rooms. They can also be used to enhance the flow of conversations. If the aim is to encourage more dialogue exchanges, place them facing the sofas. This encourages face to face interactions and better socialization. Placing the loveseat perpendicular to the sofa, facing the TV wall is suitable when socializing is not a priority. In a seating style where the loveseat is facing a TV, it is ideal not to place any seating in front of the TV mounted wall. This prevents any item from hindering your view. Place an end table between the sofa and the loveseat, if they are placed perpendicular to each other. This balances the heavy visuals of the sofa, adding weight to the smaller loveseat. It is also recommended to place the loveseat 8 to 10 feet away from the walls with focal elements such as a fireplace, TV, or art installations. A recliner adds additional seating space in a room and supports other essential seating elements in the space. Although it is not deemed as conventional seating arrangement, it can be used to add old world charm with proper placement. It is most suitable to have the recliner angled into the room. Have it facing towards your seating area if the focus is on encouraging interactions. Designing your layout with the recliner in the corner helps bring a sense of proportionality to the room. You can even shift its direction towards the TV or fireplace if socializing is not the focus. Place it adjacent to the sofa, preferably at a 45-degrees angle. If the recliner is placed at an angle in front of a wall, it is best not to have it sitting too close to the wall to avoid paints scratches and peels. Allow at least a foot’s space between the recliner and the wall during its optimum extended mode. Recliners are ideal for relaxing or catching up on a book, but also provide a cozy looks to a small room without taking away from the visual appeal. Adding a small table with a lamp, book stands, or containers helps to combine the recliner with the rest of the room. A lean standing lamp can provide ample light, and style to your recliner corner. In small square rooms, opt for a clean design with solid colors. Utilizing these simple tips will help transform your small square room into a living space worth praising. These will make your square room appear larger while adding comfort. With minimal adjustments to your furniture’s placement, you can add visual appeal without burning holes in your pockets. Renovating, redecorating, or when thinking of refurbishing interior spaces, accessories are the first to come under the line of fire. However, window accents and related upholstery can contribute greatly to uplifting your room’s look. By making minimal changes you can restyle your home; updating your window fabrics can make open spaces seem welcoming and inviting, or create the illusion of space in congested spaces. Long gone are the days of curtains as blinds evolve from being staple office décor to offering homeowners flexibility in displaying their unique panache and style. Offering various options for privacy, blinds can range from between elegant, to contemporary. Some designs even offer the added functionality of being energy efficient. If you are thinking of redressing your windows with blinds, you can purchase inexpensive blinds here. Offering premium quality at a fraction of the cost, you can also choose from a wide variety. Rather than troubling your mind for living room blinds ideas, take note of the list of options compiled below and bring your living room into 2019 with style. The malleable nature of bamboo allows various design possibilities. Lightweight yet sturdy, the slated varieties are most suitable in uplifting gloomy spaces. However, these varieties may require liners to provide better insulation from heat and direct sunlight. Bamboo blinds contrast beautifully with softer fabrics adding a layer of warmth and texture to the room. Choose shades with organic and natural wood textures; preferably in stains of whites, browns, or black. A sustainable choice for the environment, these will augment the rustic appeal in your indoor spaces. To add a touch of contemporary living, keep the slate size to less than an inch; thicker slates are great in exuding traditional charm. Faux wooden blinds mimic the style and charm of real wood. These are available in multiple hues and patterns, and effectively add bursts of colors to living spaces. Affordable and low maintenance, the ombre varieties of faux wooden blinds move from white to bold colors, adding dual tones to compliment various décor pieces. From natural wood to even shiny gold finishes, these blinds work well in a room with understated and simple furniture to add a tasteful tint. Similar to bamboo blinds, thick slate sizes enhance old-school vibes while thinner slates introduce your room to this millennium. Thanks to the versatility of wood, the material’s possibilities are endless. From Venetian, to Roman and contemporary, there isn’t a design that wood cannot master. The texture of woven blinds holds a certain rawness understated by the design’s sophistication. These balance nature with design and are ideal for indoor spaces. Tightly woven blinds provide the benefit of filtering light while protecting against heat. These are available in a variety of hues, from lighter tones such as light sand to darker ones like coffee. These complement velvety fabric draws and pair well with deep colors. These add an old-world charm to the room, and are ideal when highlighting antique appeal. When pulled back they stack evenly resembling a frill, the folding of the fabric adds a hint of luxury and style that compliments various window designs. Roman blinds fit smaller windows well, since their design does not spill over the edges of the window. However, with the right pattern and color they can serve to flatter large windows as well. The benefit of opting for roman blinds is the mass customization it offers. Cloth is generally available in a range of hues, patterns, textures, and materials, and there is no limit to the options available when you get down to creating. These can be customized with fabric liners to allow semi-private or complete sun blocking abilities. Fabric varieties may range from cotton, Tencel, linen, to organic cotton that impeccably fits any décor style. Available in cordless, thermal-lined, top-down or bottom-up drawing styles; roman blinds are rich in function and flair. These blinds roll up into a cylindrical rod when closed and hang like a panel when spread out. Easy to operate thanks to the push button, these are ideal for covering larger windows without doing too much. Mimicking the feel of drapes, these add functionality and are economical and chic options for the budget enthusiast. Choose light blocking materials for sun facing windows or use sheer fabrics to light up the room with sunlight. You can even get motorized blinds that eliminate the need for manual operations. These can be used in place of artwork with vibrant and dramatic patterns and images in a room with less wall space and big windows. Durable and low maintenance, these are available in cordless varieties for an effortlessly clean look. And offer users the creative freedom to choose from multiple fabric patterns and textures. If your room has larger walls, roller blinds with vertical stripes can accentuate the dimensions of the room. These work well with tall and thin windows or windows located high up on the wall to add extra proportion to the room. Soft and long-lasting, cellular shades are one of the energy efficient varieties in the market. These are suitable for individuals looking to maintain a modest energy bill throughout the year. The beehive-shaped cells situated behind the blinds have multipurpose abilities. Trapping air in pockets in cells, these shades can be used to insulate against heat and direct sunlight in summers, or to redirect heat towards the room in winters. These fit larger windows well, giving the décor an elegant and modern appeal. Draw them top-down, bottom-up, or opt for the clean cordless look to maintain your privacy. From printed covers to bold colors, these offer a large variety to enhance the overall look of your living room. For better diffusion of light in dimmer rooms, opt for semi or light filtering materials. For windows that receive direct sunlight, purchase blinds with heavier materials to enable better control over the influx of light. Affordable and easily replaceable, these are best suited for a budget friendly makeover in a contemporary home. Their vertical length makes the walls appear taller while their soft tones make the room appear larger. Hence, making them ideal for home owners aiming to give their living rooms the illusion of space. Vertical blinds also offer a rotation feature to block out direct sunlight. Initially used in office décor, vertical blinds now come in a variety of patterns and colors, ready to elevate the style quotient in indoor spaces. Irrespective of the style of your window, these blinds for living room will aid in enhancing the visual appeal of your interior while adding charisma. Whether restyling or renovating, these add drama and panache to your living room. Blinds offer the most functionality in terms of window dressings owing to their cost effectiveness and high performance in maintaining optimal privacy in living spaces. Their applicability and adjustability make them the proposed look for interiors, stepping into a new year. If your files have started falling off the corners of one-sided desks or you have too much gaming-gear to fit in a tiny space, it might be time for you to start looking for a good, big L shaped corner desk. These desks can not only help you get a more spacious workspace, but also utilize the room’s corner productively. However, as with anything, the presence of numerous desks in the market has resulted in increased difficulty when looking for the best L-shaped desk at affordable prices. Here, we have rounded up a list of desks, in no particular order, that are gaining popularity quickly because of their increased utility, durability, and design. Remember to stick around and read our buying guide as well to get the desk that suits you best. 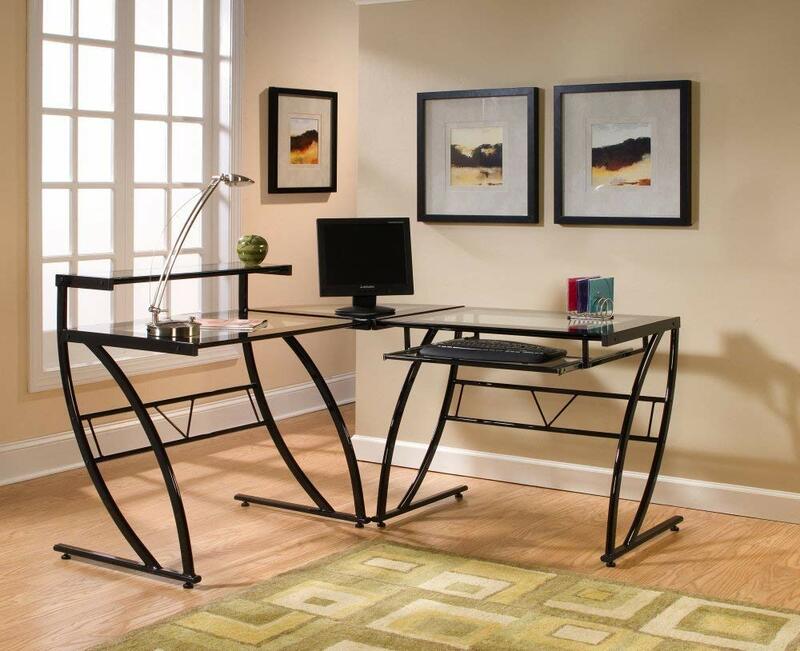 This L-shaped computer desk features a sleek design that is both, modern and durable. It is available in three distinct colors; espresso oak, harvest cherry, and heather gray, so that it can sit well in any environment. 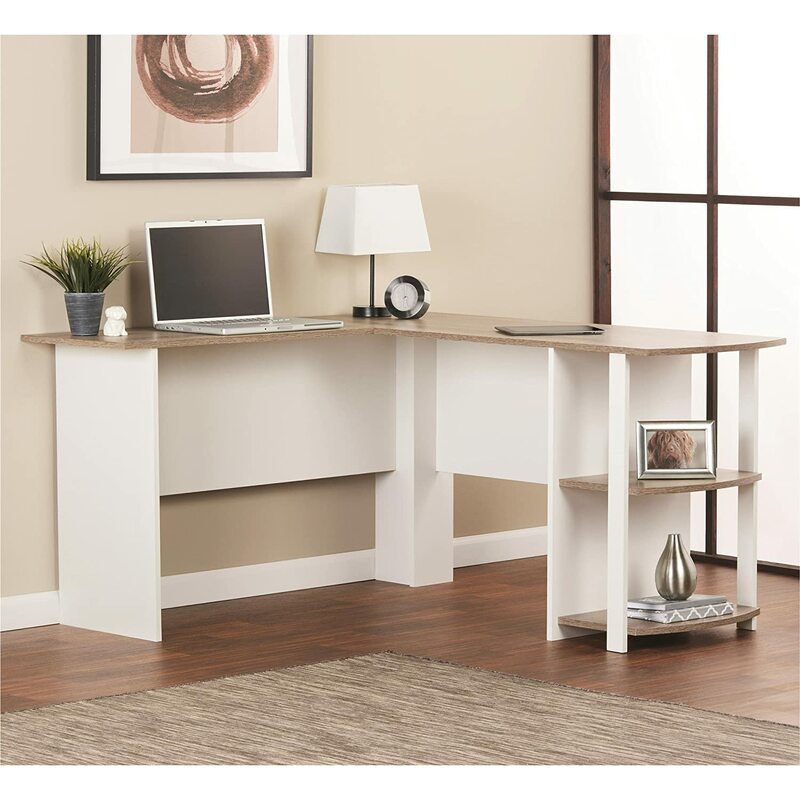 Another popular item on this list is Ameriwood Home’s Dakota L-shaped desk, featuring a wide range of color options with bookshelves on the sides. These bookshelves can be the perfect home for your Blu-ray discs, collectibles, reference books, or files. The table is available in black oak, dove gray, espresso, saint walnut, and pearl white so that it fits perfectly with your room’s aesthetic. If a spacious desk with a neat and clean aesthetic is what you’re going for, you just can’t beat this L-shaped desk. Monarch has designed this desk in a very elegant manner, giving it a glossy finish that boasts of having it all – a spacious cabinet, drawers, and bookshelves. Storage is, therefore, not an issue. The table features two distinct colors; white and dark taupe to give you the aesthetic boost you are looking for. The material is not that thick, meaning that it isn’t as sturdy as it could be at the high price. 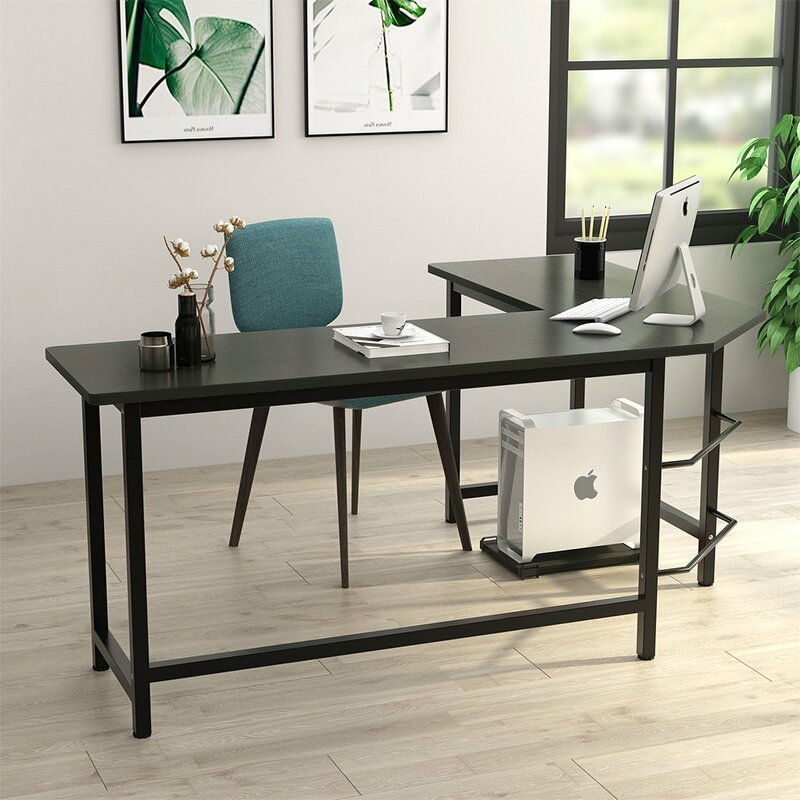 While all the tables listed here have a modern design and tend to stand out from the crowd, if you are looking for something a little more low-key, Tribesign’s Modern L-Shaped desk is the best choice, since it features a wooden texture on top of an aluminum frame. The table can be placed with or against a wall, and offer the same, if not more, level of aesthetic improvement. For people looking for that ‘wooden’ aesthetic, Harbor View’s Sauder L-shaped desk is the perfect choice; as it is both, stylish and extremely useful at the same time. The table is available only in one finish; the salt oak finish, but it can sit well in any setting without fail. If you like to work or play in a classy and stylish environment, Z-Line’s Belaire Glass L-Shaped Desk comes highly recommended because of its contemporary blend of metal and glass. The surface of this desk is made of tempered glass reinforced by a metal frame under it. It is available in two styles; one with clear glass and one with a black border on the glass. 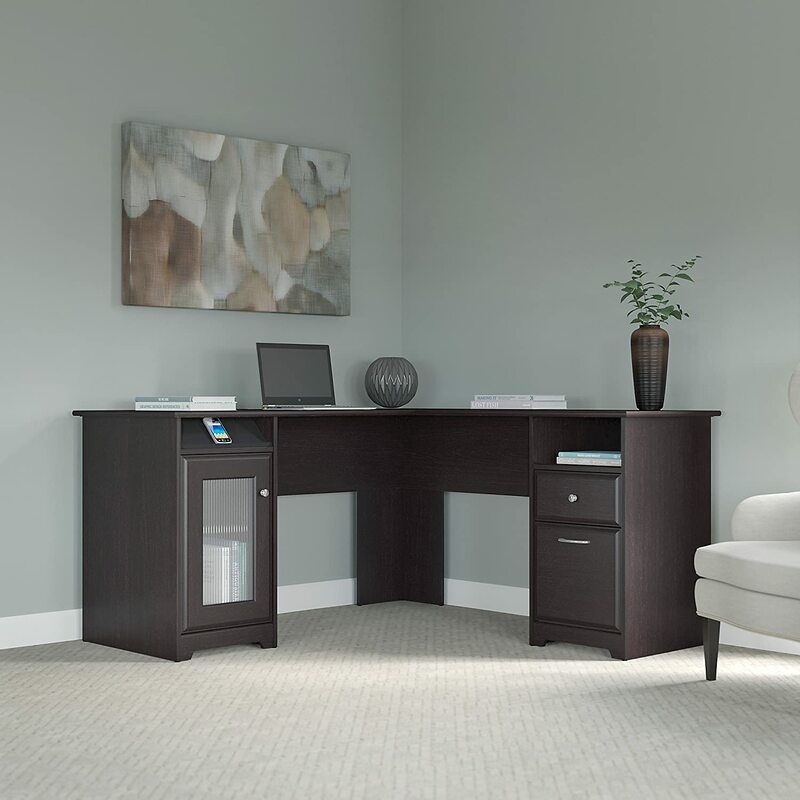 Comfort and utility are the prime factors you need to consider when looking for the best L-shaped desk. However, the threshold of comfort and utility is different for each person. To make sure the desk suits you, you should keep in mind the following. 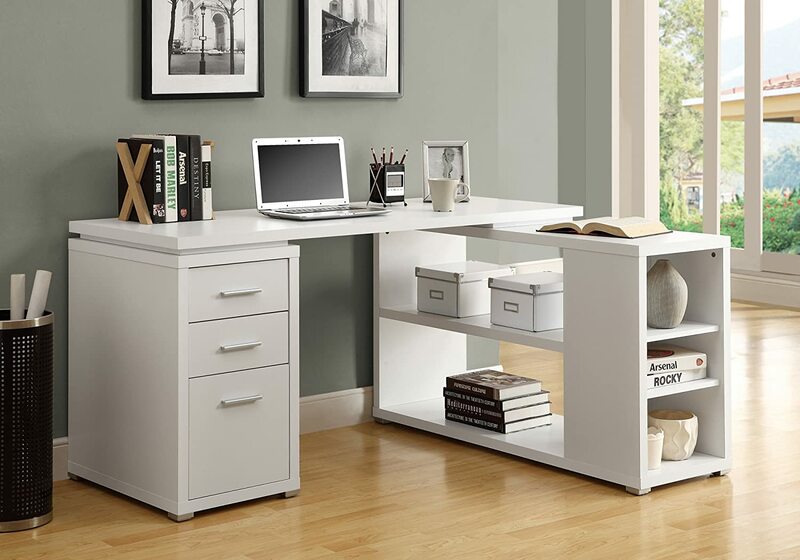 L-shaped desks are the perfect fit for smaller rooms where you need more workspace. However, it is still important to consider whether the desk will fit your space or not. Other than the room size, you should keep in mind how small a desk is too small, and how big is too big. By length, we mean the surface’s length from one corner to the other. Most desks, including the ones mentioned above, are roughly 50-60 inches (127-152 cm) long, giving users enough space to spread their arms. Basically, you need a workplace where you can put one file aside when working on the other, without having to stuff it all in one place. While wider tables mean that you get more space to push your laptop to the far end and work on your file, they also take a lot of space. Consider your position carefully before deciding how wide/deep you want your desk to be. Considering the height of your desk is paramount when it comes to working comfortably, as it affects your body posture. Too high and your shoulders will get tired. Too low and your back will suffer. When buying an L-shaped desk, make sure you take into consideration your height as well. Your back and shoulders should be relaxed when you sit to work on the desk. While most people aren’t as concerned about how much storage they get, for some it is the prime determining factor. If you are someone who wants a lot of storage capacity for your games or files, you should look for a desk with drawers, shelves, and cabinets. Material and durability are directly related to each other, that is no secret. Wooden desks are more durable compared to fiberboard, and fiberboard desks are more durable compared to glass. You should consider how much weight you’re going to put on your desk and how much it can withstand before you buy your L-shaped desk. The material also has an impact on how scratch-resistant a certain table is. These considerations reflect on your desk’s design as well, as there are bound to be differences in the aesthetics of wooden, fiberboard, and glass desks. You should establish a budget before you set out to look for a desk. This will help you visualize the maximum and minimum limit of how much you’re willing to spend and what type of desk you can get (material, design, size, etc.). Remember, you will need to buy an office chair as well! Depending on your writing hand, you are going to incline towards putting things on one side or the other more easily. You should buy a left corner desk for lefties while righties would be more productive when using a right-cornered L-shaped desk. Not only does a well-appropriated desk enhance your room or workplace’s aesthetic it also makes working on it much easier. The right size and type of desk can help you increase productivity by making sure everything is within reach. We have reviewed some of the best L-shaped desks available in the market, each with the ability to add class and elegance to your office or room. L-shaped desks are becoming more and more popular because of their space-saving design, and sturdy and comfortable construction. So you’ve move into your very first apartment, now what? You would think the next step is to buy furniture and start decorating your space, and most people will head straightaway to the local furniture store. Yet there is another option to consider, which is renting furniture. Yes, you can rent furniture. Just pick out what you like and need, pay for the monthly furniture bill, and you’re all set. But is it really worth the money? Wouldn’t the cost of renting furniture be more than buying new pieces? PRO: You don’t have to move your furniture. This is especially great for students and short-term buyers who will eventually move from one place to another in a year or less. PRO: You don’t have to spend too much money on furniture. A quality sofa can cost you up to $1,800 in IKEA, whereas if you rent a furniture, the rental rates can range from $300 a month to $106 a year, depending on the package. If you are living with roommates you can split the bill and save money. Founder and CEO of furniture rental service Feather, Jay Reno believes that it’s no longer about owning a dream house. “Today, people aspire to have freedom and flexibility,” he said. His company allows his customers, usually millennials, to hire furniture that would usually be out of their price range. For students, and those in short-term contracts, this allows them to furnish their apartment with pieces ranging from a “plush velvet sofa to a geometric coffee table”. PRO: You’re making a greener choice. When you buy a piece of furniture, you pay for its manufacturing and shipping, which means you contribute to the world’s overall carbon footprint, not to mention the loss of resources. This also goes double when you move and decide to leave the furniture behind and buy a new piece for your new location. CON: Some stores charge a few miscellaneous fees. You may be charged for insurance and any damages that the furniture incurs while it’s in your possession. High-interest rates might also dissuade you from choosing rental furniture over brand new ones. If you have a poor credit score, it might increase interest rates. Late payments can also affect your credit history. All in all, as long as you’re disciplined and diligent when it comes to paying your monthly furniture rentals and looking after them, you don’t need to worry about extra fees and charges. Outside of finances, the next most important factor to consider is time, as it all really depends on how long you’re going to stay in your new home. If your renting an unfurnished apartment for a short period of time, say a year or two, it could be a good money saving option, compared to buying new furniture and then facing the prospect of having to move it to a new place in the near future. If you have bought a property and are only planning on staying in it for a short duration before you sell, then renting furniture is an option to consider. However, when it comes to buying a property, James McGrath in his buy versus rent article on Yoreevo states that five years is the minimum to give it the best chance to increase in value and generate a future profit. For long-term residence like that, purchasing, rather than renting furniture would be the best option as it could also increase the value of the property when you come to sell it. With furniture now available for rent at the click of button, homeowners have more choices than ever with how to furnish their home. It is just a case of working out which is best for them. Working full time and maintaining a clean household can be a struggle. Whether you’re a student or a parent that spends over 40 hours of the week outside their home, trying to keep a clean home can be a hassle. If you prepare your week right, you can avoid having to deal with the drama that comes with a messy home. Keep reading for all the information you’ll need to equip yourself to have a consistently clean household. First off, keeping a clean house is not a habit that can be obtained overnight. You have to incorporate chores into your daily life gradually, or you’ll never truly have a clean household consistently. Once you successfully do this, you’ll be on track to having the cleanest home possible. In fact, when you have guests randomly come over, you won’t have to worry about your place being presentable because you’ll have already cleaned your home. We have found that sticking to certain rules during the week makes cleaning your apartment or home a breeze. Below we will be breaking down cleaning tasks you could implement into your daily schedule that will ensure your home always stays in a constant state of cleanliness. An effective way to stick to a cleaning schedule would be to specify all the chores on a calendar which you place on your fridge. If you have kids at home, you could separate the tasks on the calendar as well. You’ll have two sets of chores, one that’s completed weekly and another that is completed daily. Weekly cleaning tasks tend to be much more intensive, but they ensure that your home is not just tidy, but clean. We tried various weekly cleaning methods and figured out that by reserving one main chore a day significantly decreases the overall work you have to do in the long run. You don’t have to stick to this specific schedule, but you can see how setting goals for yourself can help you achieve a clean household. People who work full time will find it useful to split the weekly chores with breaks in between. This means you don’t have to perform all the recommended chores listed above consecutively, but you still have to make sure you do them. To be as efficient as possible, spending 15 minutes doing weekly chores should be sufficient enough time. If you can’t seem to hit that mark, you’ll get there in no time. In fact, those who have weekends off like to perform some of the more exhausting chores such as washing the floors on a Saturday or Sunday. If you consider cleaning to be a therapeutic part of your day, then reserving it for the weekend would be a great idea. Cleaning doesn’t just stop at weekly chores. It takes 21 days for something to become a habit, so after you complete 21 consecutive days of daily cleaning tasks, you can officially declare yourself a cleaning master. Don’t put yourself down if you can’t keep up with performing every single cleaning task we recommend you do daily. You can begin with something as simple as making your bed right after you wake up in the morning. The easiest way to become a master in cleaning daily is to always clean on the go. Whenever you see something out of place, and you have a moment to spare, take that time to address the problem. For instance, you don’t want to let you trash pile up when you’re already going out and passing by the trash can. There are some chores you should limit yourself to completing monthly. Your fridge and stove don’t require much attention, so dedicating one day of the month to deal with cleaning it shouldn’t be too much of a hassle. At first, you’ll find that cleaning your stove and fridge will consume some of your time, but it’ll be worth it. This is because the next month you try to clean it, you’ll do so in a fraction of the time. Those who don’t make a lot of messes, to begin with, you don’t want to go overboard with the cleaning. The last thing you want is for cleaning to feel like your second job. If cleaning your home while working full time is too much for you to take on, then you should consider hiring help from a third party. For some people, having a house cleaner come in once a week or twice a month lifts a lot of pressure from their shoulders. A house cleaner has the skill set to make your home sparkle in under a couple of hours. Your house cleaner can easily clean those corners that you can’t seem to. As technology has taken over every facet of our lives, it has also infiltrated the cleaning market. Since having access to a house cleaner is now simply a click away, you don’t have to be considered wealthy to take advantage of hiring a maid. Through the cleaning service, you can book a trusted house cleaner to come to your house whenever you please. In fact, you can hire a simplymaid in Perth anytime you please, and you can rest assured that these are five-star cleaners. Whether you have a big home or a tiny studio, simply maid can be of assistance. A trained cleaning team of two people will show up with all the necessary supplies and tools they would need to guarantee a sparkling clean household. With the helping hand of a simply maid house cleaner, you can ditch having to complete those weekly chores and instead spot clean and rely on your cleaner for the rest. Whenever you see a portion of your house that could use a quick cleaning, you should take the time to address it. You won’t be sorry because it always keeps a certain area tidy and you don’t have to fret about dragging in dirt from one part of the house to another. If you have kids at home, try to instill this as a rule because it’ll make your life at home a lot easier as well. You can now have the best of both worlds, an impeccably clean house as well as working full time. Who says you can’t have everything you want in life? Hopefully, the tips we gave you above have inspired you to start switching your household from being a messy one to a clean one. There are a myriad of ways to distress your furniture. And in this guide, we’re here to give you some tips on how to do so. How Many Distressed Pieces of Furniture Should Be in a Room? There isn’t a set answer to this question. But, as a rule of thumb, every piece in the room doesn’t have to be distressed. At the same time, having one piece of distressed furniture will not give you the vintage appeal that you’re looking for. If you do have more than one piece of distressed furniture in your room, make sure that they are not equally distressed. Just use common sense. If one piece is highly distressed, then the other piece should only have small indications of wear. This is self-explanatory. In order to make the best painting results, you’re going to have to use the right piece of furniture to do so. As a rule of thumb, only look for solid wood furniture, whether its a chair, dresser, or an end table. One of the best places to look for furniture is the thrift stores. In addition, you can look for them in estate sales and auctions. Who knows? You might find a nice piece of furniture that needs minimal cleaning up on your end. Remember, you want to take your time when looking for furniture. Don’t impulsively buy a piece of furniture just to buy it. Know that this piece of furniture is something that you’ll use for your home. Once you’ve obtained your furniture piece, take a few days looking at it. Decide if you want to paint the finish or work with it to create the distressed effect. Stained furniture has a patina that reflects the wood grain. Almost every experienced collectors or decorators of antiques will warn you never to destroy the patina by paint stripping the furniture. As we’ve stated earlier, decide if you want to work with the existing piece or if you’re going to paint over the furniture. If the existing piece is worth painting, then all you’ll have to do is clean the piece. You should use this technique if the furniture has been repainted multiple times. Start by purchasing protective gear and using a paint stripper. Then, apply the paint stripper on the furniture and follow the wait time on the instructions. You should use a scraper to take off the old paint. Depending on the appearance you’re trying to achieve, and how much layers the furniture has, determine how many extra layers from the paint stripper that you’ll need. Most beginners like this technique because it requires the least amount of supplies and is simple to do. To do it correctly, use a dry brush and slowly go through the surface. Make sure to have some extra paper towels to remove the excess paint when needed. As its name suggests, this technique requires a lot of sanding in order to get the distressed look. You can use a hand sander, sandpaper block, or sandpaper, depending on how you want the distressed furniture piece to appear. To give an authentic look, sand certain areas that would have shown wear over time (i.e. edges, near handles, etc.). This technique uses paint in a powdered form, and you add water to make a distressed look. This paint can create dramatic results depending on the techniques that you use. If you want to add age to your furniture, just add glaze or antiquing wax. This is a fast technique that works quickly. To do it, allow the product to go on the painting and then remove most of it, with only one piece of color left. As a result, the paint will look like its naturally wearing. How Can I Distress Painted Furniture? Follow these steps to ensure that your painted furniture gets the distressed look. With fine sand paper or 0000 steel wool, start by smoothing out any rough patches where the paint began stripping away. Don’t worry about dings and dents. You’ll want them on your furniture. Select a spray paint color that you want to color over the exterior. For instance, when you paint the exterior of a furniture piece, don’t allow any paint to reach the inside of the drawer (it will ruin the final result). Once the piece is dried and painted, use a rubber mallet to rough up the furniture piece. Sand the sharp edges and the corners to give a worn appearance. If you’re going to use spray paint, make sure that it’s a weekend project. Don’t paint the piece in one day. To do it correctly, lightly spray the surface that you’re attempting to paint. After that, let it dry off for a few hours. Once it’s dry, reapply the spray paint until the surface is coated and smooth. Don’t brush or spray paint furniture that’s not completely dry. This will lead to the paint peeling off and blistering. Don’t paint in the hot sun or when its damp or humid outside. Painting in the morning can be disastrous if you’re painting outdoors. Spray painting will lead to a good finish if you’re patient. Painting too fast will lead to more runs than necessary and lead to you taking more time to complete the project. If you’re going to paint by the brush, use a small bristle brush. Don’t pick the cheap brush; it’s better to go for quality in this project. Take some time to practice before applying the paint on the furniture. It will take a couple tries to get it right, but you’ll get the hang of it after a few tries. If you want to know how to distress furniture all it takes is the right tools, patience, and a bit of technique. Don’t waste your time by going too fast or using too much paint at once. Ultimately, you’ll have a nice piece of distressed furniture in your home once you take the right precautions and techniques to do so. The tapestry is one of the most popular in-home decorations. Why? Because its inexpensive and can has multiple ways to be placed in your home. Fortunately, we’ve created this guide to help tapestry newbies find out how to add their favorite piece on the wall. So are you ready? Let’s start! When you first receive your tapestry, it will appear folded up. While most people tend to hang it up as is, we’re going to warn you not to take this mistake. Instead, iron your. TIP: You might have to increase the temperature of your iron and use steam to remove the folds. But it’s better to test it by using a corner the tapestry first. Use a wall stud finder to search for the best place to hang your tapestry. Alternatively, you can get wall anchors if you plan on drilling on masonry or drywalls. A good wall tapestry will need some support to help it stay on the wall. That’s why we suggest that you keep a pair of sawtooth picture hangers to help your tapestry stay in the right place. Use a rod to hang your tapestries that have pockets in the back. If you have a large or rectangular piece, you can place it over the headboard to create a stunning sofa display or drape it over the road to make a faux headboard. Thicker tapestries and textiles will need more support. Using a baseboard will help secure it to the wall. Choose a board that will fit behind the tapestry in the rod pocket. If your tapestry doesn’t have a pocket, you can sew one in using a heavy fabric. Then, cut the board so that its smaller than the entire width of the tapestry. Place a mark where you’ll place the screws in and start to drill holes in that location. Place the board into the pocket. After that, fold the tapestry sides back and use the screws to place the board on the wall. We suggest that you use the baseboard technique as it provides the most security. Not only does it give your tapestry a strong foundation, but it will keep it attached to the wall and has a low chance of falling off. Start by measuring the length of the tapestry. Then, drill the screws in the wall at your preferred distance. Next, measure and cut slits on the tapestry. Also, you need to cut the slits large enough to ensure that the rope will fit through. If you have thinner rope, then use short slits. For thick rope, make it longer. Cut the rope until you’ve reached your desired length. And make sure to have a bit of extra space on each side, to give you enough space where you can tie a double knot. Place the rope between the tapestry slits. When doing this step, take account for the amount that you have left for each side. Doing so will help the tapestry stay even on both sides. Tie more rope on the large screw on the wall. We suggest that you do this for both sides. On most occasions, a double knot will get the job done. Make sure that the screw head is large enough, so the knot doesn’t accidentally slip off. Now you have a very interesting rustic hanging in your room. To conclude, we believe that knowing how to hang a tapestry is a great way to add beauty to your home. By following these steps, you’ll be able to have your favorite tapestry placed on your walls evenly and without too much hassle. Ultimately, grab your favorite tapestry, and a few key supplies (i.e., screws, board, etc) and start working! Choosing the right furniture for your home and your office can be difficult without the right advice, which is why we are prepared to share some of the much-coveted secrets in our business and make it possible for you to choose the right seat no matter where you find yourself at the moment. Whether you need comfort or something else, it will often dictate what kind of seat furniture and arrangement you will make. Mobile mogo seat is perfect for a home office, but it could also work perfectly well in a sitting room, but you, of course, need to work it in a certain kind of style. Thinking of the comfort is the most important thing you can do for yourself ultimately because the comfort is what it is all about. If you first choose according to comfort you will never make a wrong decision because all other things about a furniture piece could potentially change, while the comfort it offers is often what makes a certain furniture piece the way it is. After you have found a seat that is comfortable, take some time and rethink whether it is in a certain style that will go well with the other things you have in your home or office. It can be difficult to make certain styles work together, but often you will make even an eclectic style work if you coordinate colors and designs. If you choose just according to the style, you will often make the wrong decision. That is why you will need to take time and go through these steps of choosing. Therefore, style only should not be your main concern, because there will also be other furniture pieces that will tie the room together. If it is expensive, it must be good, right? Well, actually, no. Even though many people would expect to get their money’s worth, sometimes it can be more than difficult to do so. That is why you will need to think of comfort and style long before you start choosing according to the price. If a furniture piece works well for your home or your office, if it is comfortable and you find it excellent, do not even look at the price, that is, if you can afford it. Choosing your home furniture can sometimes be a nightmare, but with our help, it will become the easiest thing you can ever imagine doing. If you are looking for professional help, you can also always use our services, but even without them, with just these tips you will improve your chances of choosing the best home furniture. Which Room Are You Refurnishing? The room that is being refurnished is the most important thing that you need to think about. The focal standing seat is one of the often used ideas in refurnishing a home, but only because it allows you to improve your normal day to day activities. This means that your furniture should work for you and improve your life. That too is possible; you need to think about this a bit. The room which is being refurnished is the one that needs the most attention at the moment, but also make sure that the furniture you use is functional in such a way that it could also work in other rooms. Making the room functional and making it work is ultimately all you need to think about. The comfort side is one of the most important things you need to think about when choosing furniture. Often, you can find the furniture piece you like in a different color and make of different materials, but you cannot change the softness of a mattress or the height of a table. This is something you need to carefully reconsider so that you will be able to function normally. Especially if a table is being used for eating or work, it should provide a certain level of comfort, as must all the chairs and armchairs. The feeling that you get from relaxing in your home cannot be replaced with anything else, so investing time into making the right choice is often the best thing you can do for yourself. Thinking about the price beforehand is not something you should worry too much about, however, having a budget is advisable and recommendable. If you want to stick to your budget that is okay too, but as a company that does this for a living, we will tell you that getting the furniture that works is much more important than any budget. Making rash decisions is also to be avoided though, so take your time, think about your budget and make a rational decision which furniture piece you can and want to get for your home.